If you've one of the rare few, you'll attempt to create your landing page, register for an autoresponder account, create your opt-in form, and then place it online. Then after wrestling with the FTP program, or WordPress plugin, and getting your title, formatting and wording just right... you finally get your first page up! You even go as far as to test it yourself just to confirm that it works and you're happy. you hit another brick wall! • Or you're just plain clueless as to how to get traffic... or at least enough of it to see any REAL significant results. So now you're left standing with two options. You either continue and press on, hoping that the answer will come, or you call it quits before you waste any more time and look for the next 'shiny' solution. Unfortunately most choose the latter option and get caught in an endless loop of buying product after product, when the majority of these courses will continue to tell you to build a list in some form or another. Thankfully you're not going to get caught up in the hopeless loop - not anymore! You're on this page for a reason and it's no accident that you're here reading these words. At some point in your online venture you realize the need for a list, not just a big list, but a RESPONSIVE one as well... one that gives you high open rates, one that buys your recommendations, one that buys your products, and one that stays LOYAL to you for many years! Finally Revealed The Secret To Building Rapid Lead Magnets That Pull In Hot Subscribers Within 10 Minutes Or Less...! 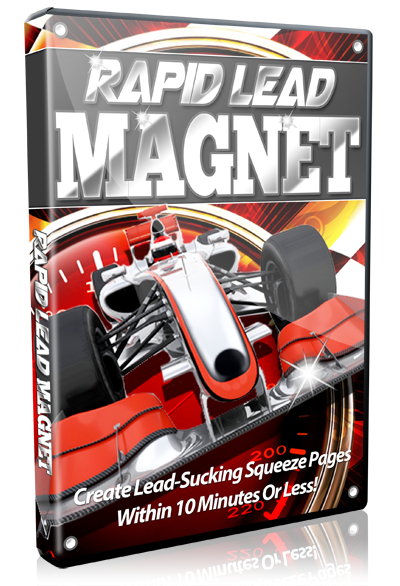 Rapid Lead Magnet is your all-in-one course that will guide you through the steps to creating high converting squeeze pages and landing pages together with a free gift that your subscribers will love you for! Not only will you see a massive surge in subscribers to your database, but you'll also set yourself up for a responsive list that will buy EVERY PRODUCT you have to offer! This is a brand new course designed for beginners and even seasoned marketers who struggle to build a RESPONSIVE list. Before we jump into the video course we will set the tone for the rest of the course. You'll be given a quick overview so that you can understand exactly what the game plan is, and then we will show you exactly how it all works from a bird’s eye view. This means that implementation will be a lot faster. The ladder will allow you to gain a better overall view of exactly why you need a high converting lead magnet or a good freebie that you can offer to people in exchange for their email address so that you can build your prospect list. You need to understand or have a bird's eye view of the actual funnel before you get started. In this video, we will be covering the biggest mistakes that people tend to make that lead to low converting sales funnels. Rapid Lead Magnet is all about speed. In this module we'll reveal to you how to create Lead Magnets at super-fast speeds once you've understood the concept and mastered the strategy. We'll give you a heads up on how this strategy will make things congruent and set the tone so that when your prospect comes through and sees your freebie they will be more likely to buy your feature front end offer and one time offers. This specific strategy will cover different types of mediums. This refers to the type of freebie that you will be offering to people in exchange for their email to be added to your list. This could be a video course, video, e-book, an important report, audio, or something else. You'll discover the tips and tricks used by top successful internet marketers who consistenty produce high conversions and ultimately profitable sales funnels. What kind of Lead Magnet page should you build it you're offering a video course as a front-end offer? Video courses are by far one of the most common product formats. How much video content should you provide? Would a sample video taken from your paid product hurt your conversions? Would it be better to offer a different freebie? How do you make sure your subscribers don't forget about your paid offer? All this and more answer in this video. What about eBooks? What kind of Lead Magnet page should you build it you're offering an eBook or bundle of eBooks as a front-end offer? When implemented correctly eBooks can be used as powerful forms of advertising. Whilst eBooks generally have the lowest perceived value out of all other forms, with a bit of creativity and thought, they can become one of your best all-around sellers and can actually be used to increase sales of video products! Don't miss out on this module! What about audio courses? What kind of Lead Magnet page should you build it you're offering an audio course as a front-end offer? Audio courses are excellent complementary products that can boost the value of video courses and can even be used as up-sells for eBook products. In this module we'll discuss the best ways to get the most from audio products and how to position them to generate the most profit! How about software? What kind of freebies can you offer to people who are interested in purchasing your software applications? Software by far has the highest perceived value online. With that said, selling the benefits is a must. Your goal is to make your visitors understand the value of your product even before they've signed up if you want to sell high-ticket software solutions. And of course last, but not least, how about services? What kind of freebies can you offer to people who are interested in your service? Like software, services have a very high perceive value but this all depends on what you can provide, how quickly you can do it, and at what price. If you provide a service that no one else is doing, then you can charge your own prices. However one of the biggest mistakes is exchanging time for money. In this video we'll discuss your possibilities and how to get around this common problem. Not having to second guess what on earth your potential subscribers want. Not having to create a 'freebie' product and hoping that it will do the job. Not having to 'shoot in the dark' with titles, opening paragraphs and call-to-actions, hoping that it will work. Not having to guess whether or not you've put your visitors in the right frame of mind to maximize your sales when you come to sell your front-end offer. Not having to face the embarrassment of sending your leads to the wrong page just because you mis-typed a link in a text field. Not endlessly guessing what type of content to create and how to deliver it. Rapid Lead Magnet puts you in the driver's seat once again so you're in full control of your business! Whether you're selling an eBook, an audio course, a video course, software or service, you'll now be able to build a proven-to-work lead magnet page that will not only build your list, but pre-frame your subscribers so they know EXACTLY what you have to offer and are even happy to see it! The end result is a HYPER-RESPONSIVE list, who open your emails, react to your up-sells and essentially put more money in your pockets! Grab the Rapid Lead Magnet course now and start creating super hot lead capture pages that all your visitors will want to sign up for! Act Now And Receive ‘Backend Sale Magnet’ To Take Your Profits Further! When it comes to Internet Marketing, you must be focused on your sales funnel. This sales-funnel and your promotion plan allows you to open up an entire world of income that is not available to most marketers. With a converting back-end you can pay for traffic, get free traffic, set up special offers and special promotions and create windfalls of cash QUICKLY! • The big breakthroughs that marketers have used to generate millions of dollars online and how you can learn and model off them! • Mindmaps of the entire process from start to finish! • Plus TONS more of golden nuggets of information! Most marketers who teach this stuff keep the good stuff to themselves and never educate the market on what’s truly needed. In this add-on program will walk you through what to do step by step and it’s MUCH easier than you realize! In fact, it’s simple as can be. We were initially going to sell the Backend Sale Magnet as the upgrade offer, but we're now including it here with your purchase of Rapid Lead Magnet but you must act quickly because we can't promise this upgrade course will be here next time see this page! Secure Your Copy Of Rapid Lead Magnet & Position Your Product, Presell Your Visitors & Boost Your Front-End Sales! Gone are the days where just a title that sparks curiousity is enough. Gone are the days where an 'okay' looking freebie would get you a lead. Let's face it, competition is tough and the market is becoming more aware and 'immune' to old hyped up advertising. Let your competitors keep making the same mistakes over and over again. Let's their leads unsubscribe from their list and come join yours! Now it's time to turn it up a notch and be one step ahead of the game. Rapid Lead Magnet is guaranteed to help you do just that. It's the most modern list-building course available today combined with old-school tried and tested tactics that truly work. This is list building at it's finest with no stone un-turned. Yes! Give Me Instant Access To Rapid Lead Magnet! YES Charles! Give me instant access to Rapid Lead Magnet! I want to create cash-sucking lead pages that pre-frame my visitors and boost sales of my front end products! We make every effort to ensure that we accurately represent these products and services and their potential for income. Earning and Income statements made by our company and its customers are estimates of what we think you can possibly earn. There is no guarantee that you will make these levels of income and you accept the risk that the earnings and income statements differ by individual. As with any business, your results may vary, and will be based on your individual capacity, business experience, expertise, and level of desire. There are no guarantees concerning the level of success you may experience. The testimonials and examples used are exceptional results, which do not apply to the average purchaser, and are not intended to represent or guarantee that anyone will achieve the same or similar results. Each individual's success depends on his or her background, dedication, desire and motivation. There is no assurance that examples of past earnings can be duplicated in the future. We cannot guarantee your future results and/or success nor is this a guarantee of ways to make money online. There are some unknown risks in business and on the internet that we cannot foresee which can reduce results. We are not responsible for your actions. The use of our information, products and services should be based on your own due diligence and you agree that our company is not liable for any success or failure of your business that is directly or indirectly related to the purchase and use of our information, products and services. ClickBank is a registered trademark of Keynetics Inc., a Delaware corporation. Rapid Lead Magnet is not affiliated with Keynetics Inc. in any way, nor does Keynetics Inc. sponsor or approve any Rapid Lead Magnet product. Keynetics Inc. expresses no opinion as to the correctness of any of the statements made by Rapid Lead Magnet in the materials on this Web page. 2019 Rapid Lead Magnet. All Rights Reserved.